Discharged nitrogen from the N2 membrane unit flows to the booster compressor package. 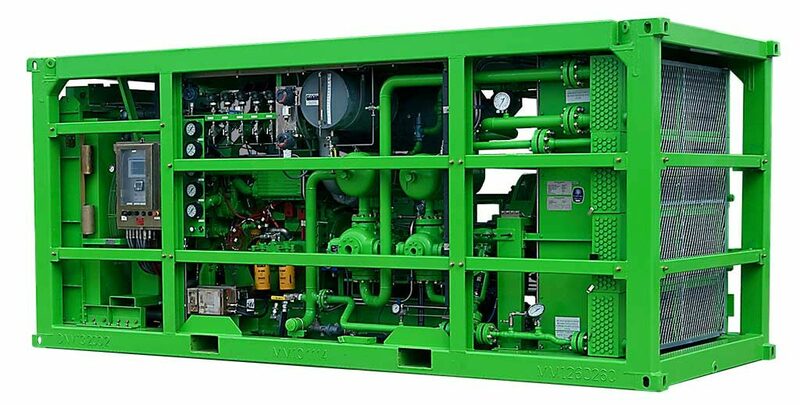 An Ariel JGA four-throw reciprocating compressor, using four stages of compression, boosts the nitrogen to a discharge pressure of between 2,200 and 5,000 psig (152 and 345 bar), and provides up to 2,000 scfm (56.5 m3/m) of nitrogen. The booster package is self-contained in its DNV 2.7.1 Crash Frame and is powered by a Caterpillar C-18 diesel engine. The package also contains a vertical cooler for process cooling and a radiator for equipment utilities. Each compressor package is controlled by industry-standard switch gauge control systems using FW Murphy equipment with the control panels mounted along the sides of the enclosures for easy operator access. All panels come with visual and audible alarms to warn operators of operational anomalies and perform automated shutdowns if problems occur with the packages. The compressor packages are built with removable roof panels to facilitate the removal of key equipment components, if required. Standardization of design and equipment are important considerations so units can be easily used by different drilling teams and maintenance personnel, as well as to achieve a standardization of spare parts inventory. For 8 hours, all compressor packages are fully load tested using air before being shipped. All units are started; performance tested, and shut down. Load testing simulates the conditions that the units would experience on-site. Once compressed, the high-pressure nitrogen is then delivered through Hoses or Hard piping to the customers destination. Contact Global Nitrogen & Oil Field Services for more information at +1.713.937.5236 or [email protected].